I've been quiet, I know. When I saw Angela's post about what's on her design wall, coupled with a few comments and emails I've gotten this week about my lack of posts, I thought I should check in so you guys all know what I'm up to. I'm not slacking, I swear! The opposite, really. I've made some progress in two ways - potty training the munchkin and sewing! Knock on wood, the potty training that started up again last Friday is still going, and going super well. It's been an awesome week, and I feel really proud of how it's going. While the potty training's been going well, naptimes have been a super challenge the last few days. Fortunately, today, the munchkin is finally asleep. I think he's finally reached the point of exhaustion! 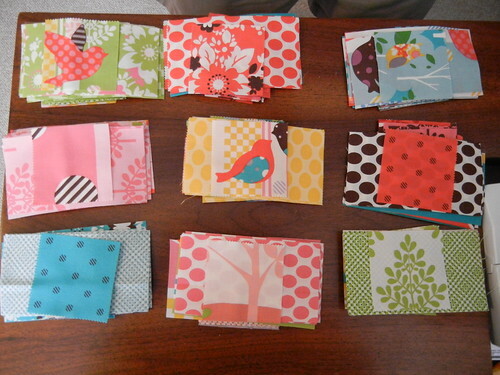 As far as sewing goes, I've got half of binding sewn down on my MHC drunk love quilt. I'm excited to finish this one off, but I'm going to finish the binding on the machine, I think. I always worry about how well my own stitching will hold up after lots and lots of washings. 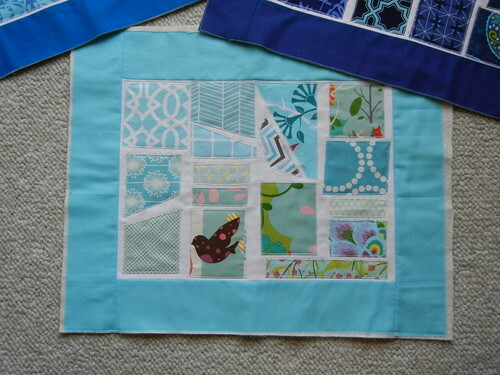 At least with the quilts I make for family, I know I can fix them if I need to, but in sending this off to a wonderful young woman having her 18th birthday, I really want to make sure I'm sending something well-made and durable, so that's the plan for the weekend. 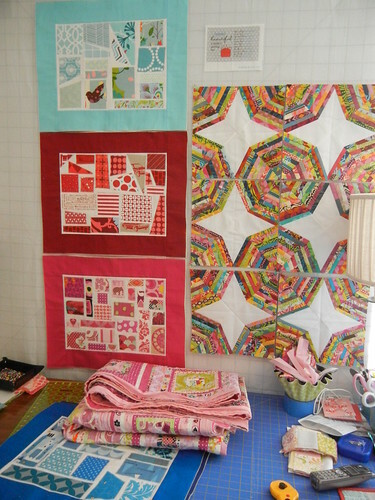 I've also gotten three more Bottled Rainbows blocks done, bringing the grand total up to 5. I really love these blocks. Just looking at them makes me happy. I'm really curious to see how this whole quilt-as-you-go style will look when it's all done and bound and everything, but so far, it's been really enjoyable to do. So, no worries, I'm still here, still sewing, just making slow progress on too many different things. What are you sewing this weekend?